Location: Highway 67 between Ramona and Poway. Use the address 16310 CA-67, Ramona, CA for an approximate location. Parking is available next to the fire station entrance on the west side of Highway 67. 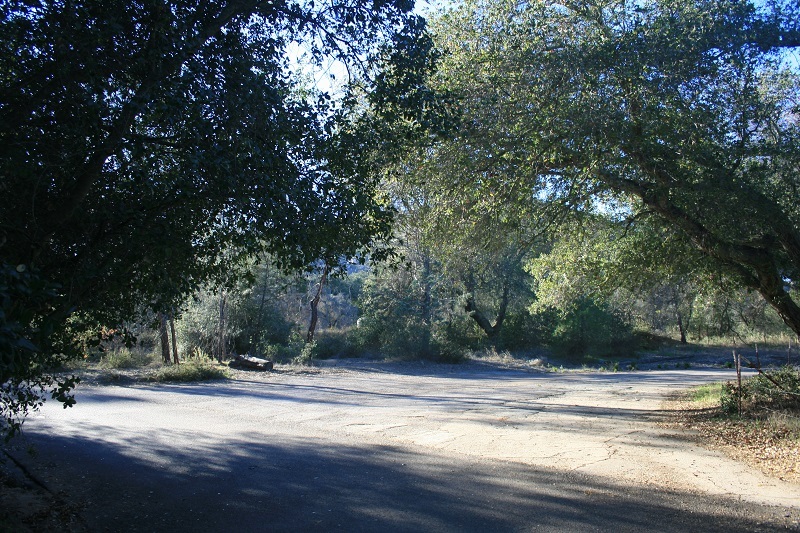 From Ramona, take Highway 67 south for 6.2 miles and park where available near the entrance to the fire station. From the south, take I-15 to the Miramar/Pomerado Rd. exit (14). Turn right on Pomerado and follow it 5 miles to Scripps Poway Parkway. Turn right and follow Scripps Poway Parkway 5.6 miles to Highway 67. Turn left and follow Highway 67 4.8 miles to the fire station. You will have to make a U-turn to park on the left side of the street. From the north, take I-15 south to Pomerado/Bernardo Drive (exit 26). Turn right and follow Bernardo Drive under the freeway where it becomes Pomerado Road. Go 0.4 miles and turn left onto Highland Valley Road. Follow it 10 miles to Archie Moore Road. Turn right and go 1.5 miles to Highway 67. Bear right and follow Highway 67 for 0.3 miles to the fire station, on the right. The destination of this hike is not the actual summit of Mt. Woodson, but a geological oddity a short distance beyond. Potato Chip Rock is a long, thin, outcrop of a weathered granite boulder. While climbing out onto it requires only a little bit of rock scrambling, with the right angle and perspective, it’s possible to take dramatic photos that look more like the remote badlands of Utah or Arizona than of the San Diego suburbs. The approach described here is the quickest way to reach both the summit and the rock; it works well for later starts as the sun will likely be behind the mountain and since the route is paved and navigation couldn’t be easier, the descent can be safely done even in dim light. 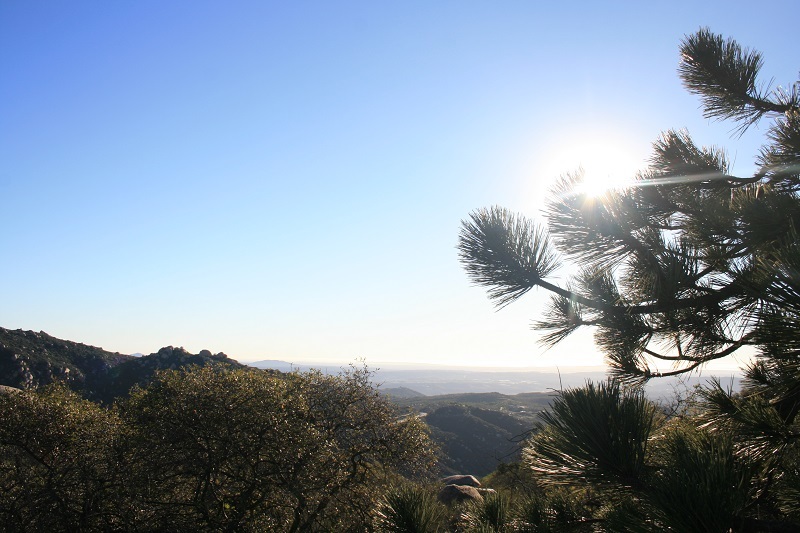 A longer approach from Lake Poway is also possible; additionally one can hike from the east and return via the Fry Koegel Trail for a longer loop. To begin, follow the signed single-track trail briefly as it parallels Highway 67. You’ll soon reach Mt. Woodson Road, paved but only open to service vehicles. Turn right and begin a long, often steep ascent. Making up for the pavement are the increasingly wide views to the east, the distant Cuyamaca Mountains dominating, as you climb. 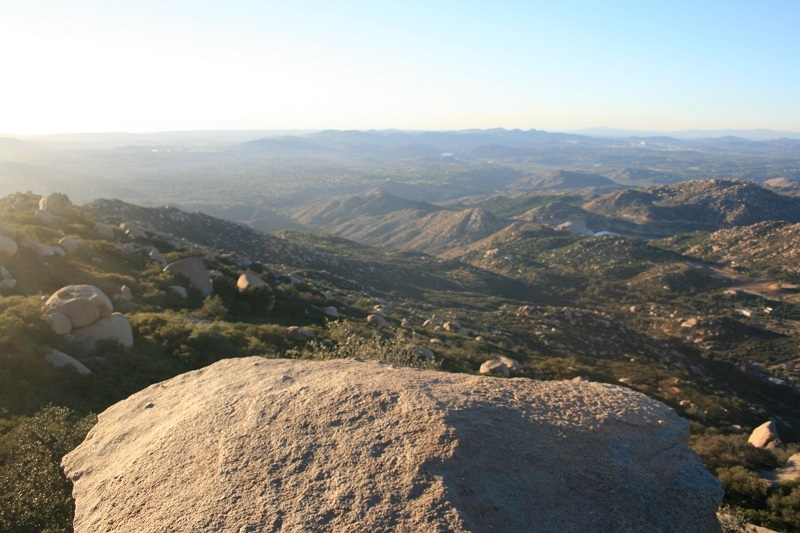 At 0.9 miles, you reach an overlook with views to the southwest, including downtown San Diego and the ocean. 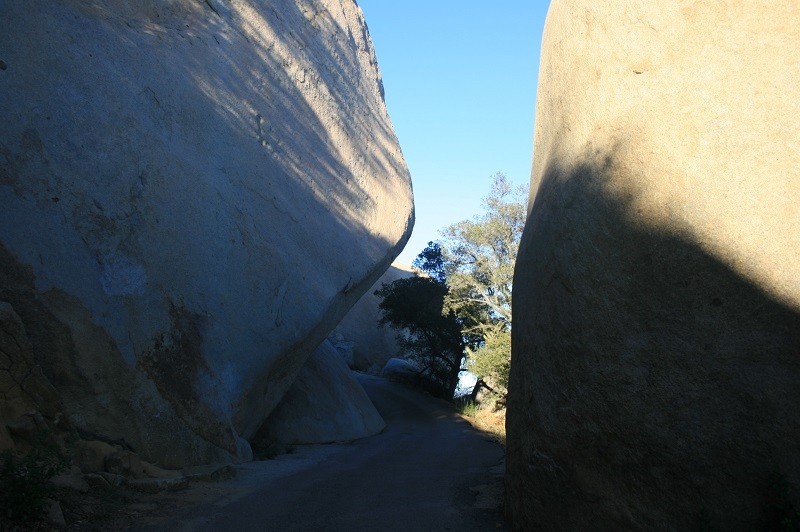 Farther up, you enter a “tunnel” where large granite boulders virtually block out the sun. You continue making switchbacks before finally reaching the summit (1.8 miles.) An overlook on the left marks the highest accessible point on Mt. Woodson (2,894 feet); however the views from Potato Chip Rock are better. Continue past several antenna installations and begin a descent. 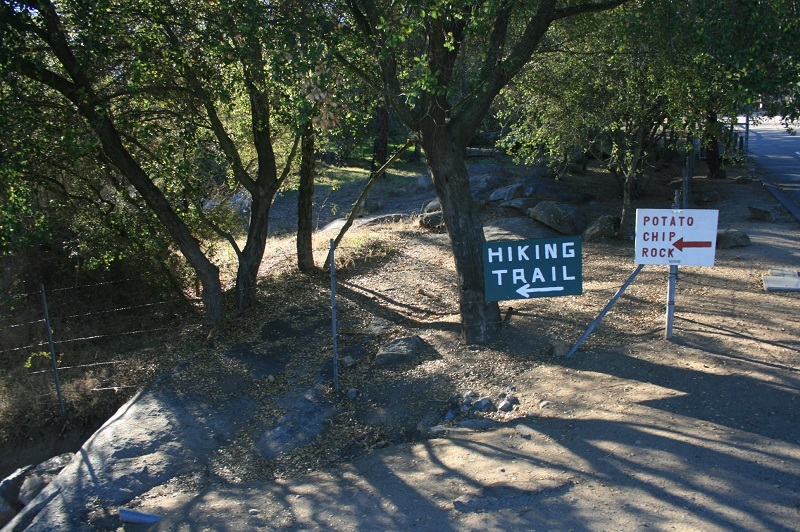 At 2 miles from the start, Potato Chip Rock appears on the right. Whether or not you climb onto the rock itself, the views from this spot are excellent: if visibility is good, you can see the San Gabriel Mountains, Old Saddleback, Catalina and San Clemente Islands and more. Those who venture out onto the rock will be treated to an even more striking perspective. In case you were wondering the mountain was named for Dr. Marshall Clay Woodson, a dentist who moved to San Diego in 1895, after having served in the Confederate Army. 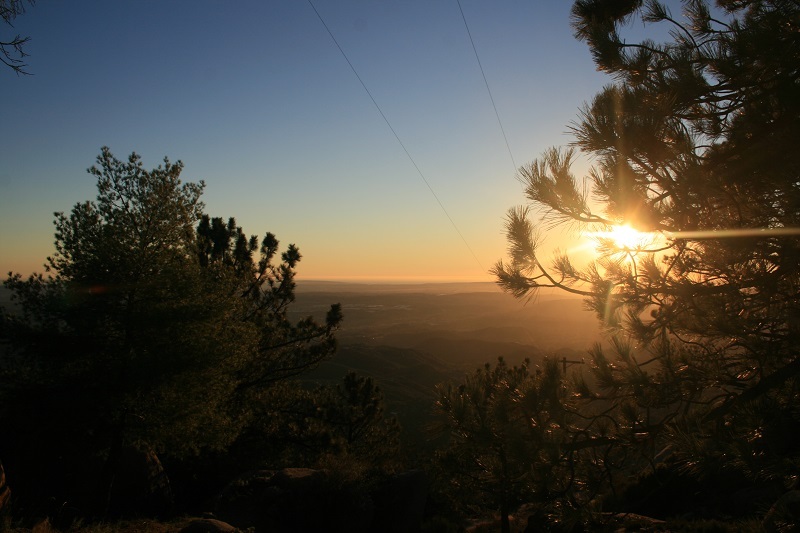 The summit has also been called Cobbleback Peak and the Mountain of Moonlit Rocks.